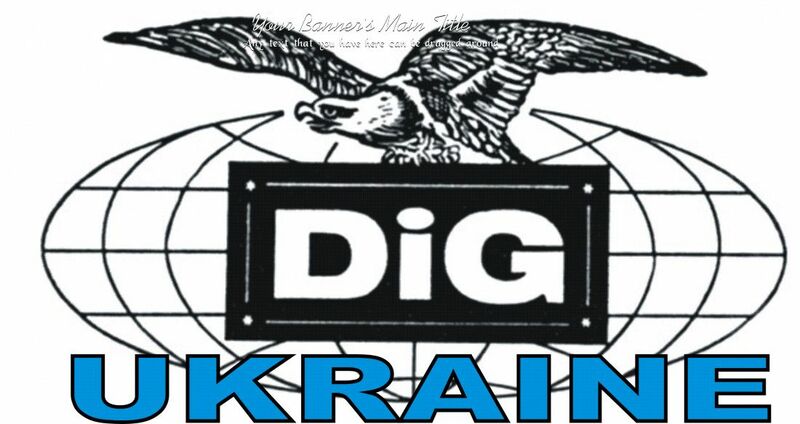 50 лет клубу DIG ! | Добро пожаловать в Сумской областной радио клуб . QSOs mit den DIG-Clubrufzeichen zählen 3 Punkte, DR50DIG zählt 10 Punkte. Unter den QSOs müssen Mitglieder aus mindestens 5 DXCC-Gebieten sein. Das Diplom wird ausschließlich als „Mixed“ vergeben. Manager Karlfried Henrichs, DL1EK per E-Mail an . Diploma Interest Group (DIG) celebrates its 50th birthday during the year 2019. 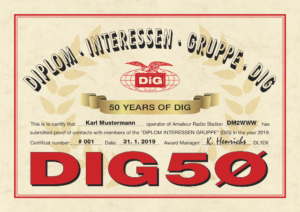 On this occation DIG issues a short time award for contacts with DIG members and club stations througout the year 2019. The award is available for every licensed radio amateur and SWL world wide. 50 Points are necessary for the award application. Only one contact per DIG member or club station is possible. Each contact with a DIG member or club station counts 1 point. Among the 50 necessary contacts must be DIG members from at least 5 DXCC areas and at least 5 DIG club call signs. Each contact with a DIG member counts 1 point. the special event station DR50DIG counts 10 points. Among the 50 contacts must be DIG members from at least 5 DXCC areas. All bands and modes may be used. No QSO via any kind of repeater or via Internet is allowed. The award is issued only on a „mixed“ basis. (further calls may be added). The award is issued only as a digital file (PDF), sent to the applicant by e-mail. There is no fee for the award. Applications in form of a detailed logbook extract have to be mailed to the manager Karlfried Henrichs, DL1EK to . The latest date to submit the application is June 30, 2020.